I had my first bird at 6 months old. It was a White Winged Bebe that was as easy to get in the 1950s as a parakeet is today. It was small and sweet and tame and would fly to my high chair and help me finish my breakfast. Of course this is as reported to me by my father who purchased the bird for his first child….me. Parrots have always been a part of my life and when my family was relocated to Houston by Katrina, one of the first things I needed to do, was find a Bird Store. I searched and found Adventures in Birds. It has become one of my very favorite discoveries about Houston. Over the years I have added to my flock from the birds raised and hand fed at Adventures in Birds. 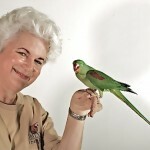 I now have an Alexandrine ( in the photo with me ) named Emmy Lou a Blue Crowned Conure and a Cherry Headed Conure. I also have 2 Shetland Sheep dogs named Harvey and Dori along with my human family consisting of a very sweet husband, Jerry, and 2 adult children, Aaron and Dayna. I am not a breeder or an avian expert. I am simply a pet person with a tremendous interest in all things birds. I have read and researched and written about birds and along the way asked a ton of questions. I am still asking questions. 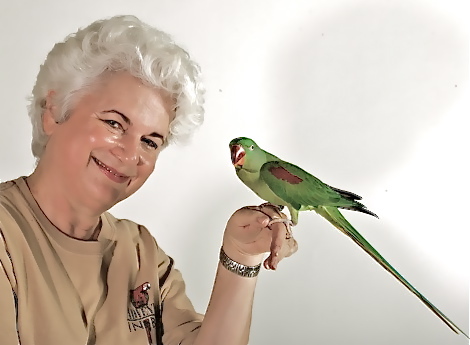 One question I asked the owner of Adventures in Birds, Jean Jordan, was “ I know hand fed baby birds are all sweet but how do they stay sweet once they are weaned?” She answered, “ They need to be handled and loved on after the weaning. It is very important to the happiness of the bird and their future family that these young birds get a lot of time and attention, but we are a small crew with only 2 hands each to cuddle with. ” And that was how the idea of the Ambassador Program was born. Adventures in Birds needed more hands and I knew there were bird people who would love to play with baby birds. It has become a very successful, fun and educational program for the volunteers and the folks that come in and see us. The biggest part of my volunteer time (besides cuddling with babies) is trying to answer questions. Everything from “ Which of these birds is real quiet? “ Answer: “None” to “ I had a parakeet when I was young and I used grit paper at the bottom of the cage. Why is it so hard to find now?” Answer: “ Because we now know that they don’t need it and should not eat where they may have pooped”. Plus so many more that I thought a blog dedicated to answering questions of all types would be of help to fellow bird lovers. I will be researching and speaking to experts so don’t worry the answers will be written by me but come from much more knowledgeable folks – Avian Vets, Breeders, Avian Consultants etc. So send in your questions and I will try to post as many answers as I can find.